The scale of the suffering inside Myanmar’s Rakhine state is “unimaginable”, the United Nations said Monday, after three of its members joined a belated government-steered visit for aid agencies and diplomats to the conflict-battered region. Myanmar has tightly controlled access to the state since last month when attacks by Rohingya militants prompted an army kickback that sent 507,000 of the Muslim minority fleeing to Bangladesh. Scores of Rohingya villages have been torched. A Myanmar official tally says hundreds of people died as violence consumed remote communities, including Rohingya. Hindus and ethnic Rakhine were also among the dead – allegedly killed by Rohingya militants. Rights groups say the real death toll is likely to be much higher, especially among the Rohingya, while the UN has labelled army operations as “ethnic cleansing” against the Muslim group. Many inside Myanmar have accused the UN of having a pro-Rohingya bias, as hostility towards INGOs sky rockets, further limiting access. Monday’s visit marks a thaw in the relationship, with the UN welcoming the trip as a “positive step” while reiterating “the need for greater humanitarian access”. “The scale of the human suffering is unimaginable and the UN sends its deepest condolences to all those affected,” it said, calling for an end to the “cycle of violence”. It also urged a “safe, voluntary, dignified and sustainable return of refugees to their area of origin”. Diplomats and other INGOs accompanied them on the trip, which was delayed from last week. But the limitations of the one-day visit were not immediately clear. 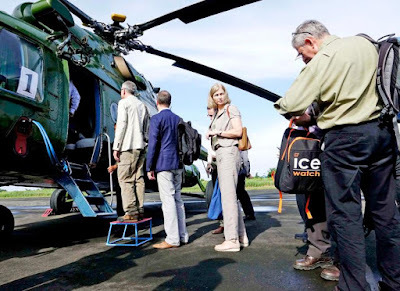 The EU delegation to Myanmar also joined the whistle-stop trip, which took in Maungdaw and Rathedaung areas, explaining in a statement “this was not an investigation mission and could not be in the circumstances”. “We saw villages that had been burned to the ground and emptied of inhabitants. The violence must stop,” it said, calling for unimpeded humanitarian and media access. International aid groups fear tens of thousands of Rohingya who remain in northern parts of Rakhine are in urgent need of food, medicine and shelter after over a month of military operations. In a sign of ongoing tensions and mistrust, a few thousand Rohingya have massed on a beach awaiting boats to Bangladesh after receiving death threats. Myanmar had around 1.1 million Rohingya before August 25 attacks by militants from the minority group sparked a massive security crackdown. The number has halved since then. Rakhine has long been a cauldron of ethnic and religious tensions, but the last five years has seen communal relations plunge to their worst yet.